Identification of hereditary factors that predispose to cancer allows targeted cancer screening and better quantification of environmental risk factors. The ability to identify which single nucleotide polymorphisms (SNPs) are associated with cancer or segregate with disease in families allows high-risk loci to be identified. 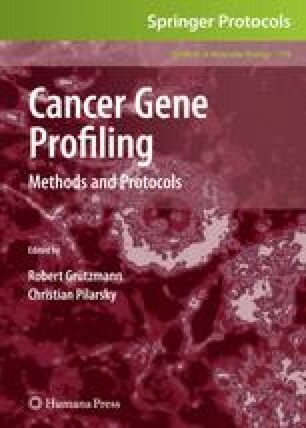 In this chapter, two platforms for analysing SNPs are discussed, the Affymetrix and Illumina systems. Application of both platforms requires the same principles of good laboratory practice but there are important differences in materials and methods, which will be discussed. Affymetrix Genechip® Mapping 500K Assay Manual.http://www.affymetrix.com/support/technical/manuals.affx. Illumina Illumina product guide 2006–2007. http://illumina.com/pagesnrn.ilmn?ID=70#39.